Croatia's RK Lokomotiva Zagreb will face the team they beat in the 2017 Challenge Cup final, Höörs HK H65 of Sweden, in Round 1 of this season's EHF Cup. 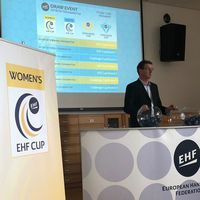 Three-time EHF Cup winners Viborg were drawn against HC Galytchanka Lviv of Ukraine, while 2007 champions Zvezda face Swiss opposition in the form of LK Zug Handball. One of just two pairings we can be sure of in Round 2 is an all-Norwegian affair between Storhamar Handball Elite and Byasen Handball Elite. The draw was made by EHF Chief Sports Officer Markus Glaser and Jim Rankin of the Scottish Handball Association.